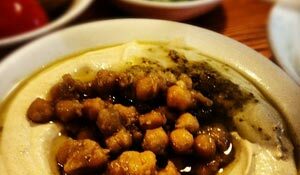 Home / Isralicious / Why did the Israelis steal hummus from the Arabs? There should be an HBO documentary series about this. Real Hummus. @ricky bobi: Asking those questions would only be relevant or ‘productive’ for those gullible imbeciles (and I’m certainly not denying that there are many of you) who subscribe to a particularly false, historically ignorant and hypocritically bigoted narrative (i.e. the ‘Palestinian’ one). Can we get this guy to write for us? If you’re serious, I’m sure this can be arranged. Well, I actually am serious. I’m not a fan of using Palestinians in quotes but thought you had some humor and sharp wit in there. However, I defer to ck on all matters relating to writers since he uses his real name and I don’t and since he launched this blog and I followed soon thereafter. He seems to be a little busy right now, so I’m not sure when he’ll have some time but there are two ways to proceed. One is for you to write him an email at jewlicious at gmail. Or, you can publish another comment here (make sure you use the same IP address as before) and this time include your real email address. If he’s interested, he’ll look you up. If he isn’t, don’t be offended because he and I don’t always share the same taste. I’m doing both. Just shot an email off to that address. Sorry for the tardiness, had no idea you actually responded until now. Yes, cause yours is correct. I think you’re too out there to even make the shitliberalzionists say tumblr. facepalm. To the chef: I doubt you can be a chef and not know this. See also: EU food laws and Israel’s failed attempt to register Hummus as only real when Israeli. Or slate had an article on Jewish Israeli and Arab Israeli cooks in the same restaurants who argue about this. There has never been a “Palestinian” country or people. The real question is why did the Arab invadors steal land from the JEWS? Uhh, the land was never called Israel, it was ancientally known as Palestine. Read some history before you comment, with bias. And it’s not wise to call Arabs invaders, since the Israelis did the same thing. That is called hypocrisy. Uhh, the land was most certainly called Israel. The twelves tribes were divided into two kingdoms, one was Israel and the other Judah (Judea). You should read your bible. Many cuisine-related sources describe hummus as a very ancient food, or connect it to famous historical figures such as Saladin. Indeed, its basic ingredientsâ€”chickpeas, sesame, lemon, and garlicâ€”have been eaten in the region for millennia. So, it is irrelevant to search who steal this very healthy food. Nevertheless, the interview shows rough estimate how large population of Arab-Palestinians Isrealis live in Israel. They are not Arab Palestinian Israelis, they are originated from Arab countries such as Iraq and Syria.